JJC LCH-A6 LCD Pop-Up Protector Cover for Sony A6500 A6300 A6000. Sony A6500 A6300 and A6000. 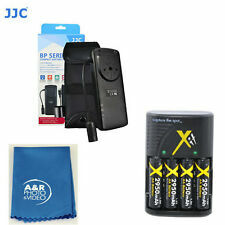 1 x JJC LCH-A6 POP-UP LCD Cover Screen Protector. The hood blocks out unnecessary light for glare-free viewing of the LCD screen. No exceptions to this rule. Wire transfers are also acceptable. It can be connected with the cage closely to prevent glare, and maintain image contrast under bright sunlight. Atomos Shogun and Ninja Assassin cage 1788. 1x Sunhood. Durable and lightweight. Can be folded and easy to carry. 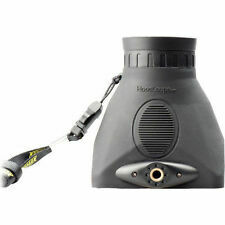 Hoodman Hoodloupe for 2.5" LCD Screens Outdoor Loupe. Condition is Used. Very little use. Pretty much like new. Shipping lower 48 US included. (Includes Miniature Tripod! 2) Place the adhesive screen protector on the LCD screen and smooth it out with the included squeegee to not leave bubbles. Slide-on design allows you to easily remove or attach the shade to your screen without fear of damaging the screen. GGS LCD screen protector is using ultra thin optical glass and special processing, it is high transparency, anti-scrape, anti-bump, anti-aging and easy to install. It is rigid and made of optical glass material, which achieves almost 90% of transmittance (higher than plastic LCD screen protectors), thus making the LCD screen clear. GGS LCD Optical Glass protector for Canon 550D. GGS LCD screen protector is using ultra thin optical glass and special processing, it is high transparency, anti-scrape, anti-bump, anti-aging and easy to install. NIKON D300 & D300s. Nikon BM-8 LCD cover. LCD COVER FITS A. Good luck. Authorized dealer. Family owned. (1x LCD Hood. 3) Connect the adhesive hard screen protector/shade. 2) Smooth out the adhesive screen protector with the included squeegee to avoid bubbling. We will try our best to reduce the risk of the custom duties. Key Features: 1.Designed for Sony A7, A7II, A7III and A9 series cameras; 2.Fixed tight to the LCD screen by two velcro tapes; 3.Light-weight hood. Compability: Sony A7/ A7S/ A7R Sony A7II/A7SII/A7RII Sony A7III/A7RIII Sony A9 Package Includes： 1 x Hood Product Dimensions: 95 X 78 X 61mm Package Dimensions: 215 X 115 X 30mm Net Weight: 26g Package Weight: 62g Materials：Nylon. These covers are similar to NIkon BM-6 covers. See the picture for detail. 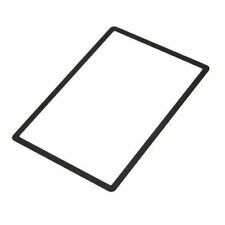 Designer: Jeff Rock SMALLRIG Screen Protector Sunhood for 5'' Blackmagic Monitor Cage 1821 is a monitor sunhood for the SMALLRIG Blackmagic Video Assist Cage(5'') 1726. The monitor sunhood mount to the cage by four screws, so it is stable and easy for assembling or disassembling. Connecting the monitor by plush side, it is perfect fit cage and prevent light leakage. Compatibility: Blackmagic 5” Video Assist Highlight For SMALLRIG Blackmagic Video Assist Cage(5") 1726 Easily assembly and disassemble Plush edge of the monitor Hood Includes: 1x Monitor Hood 4x 1/4”-20 Screw 1x Hex Spanner Material: Brushed nylon Net Weight: 64g Product Dimensions (L X W X H): 155x78x94mm. Canon EOS Rebel T6i. - Canon EOS Rebel T5i. - Canon Powershot SX60. - Canon EOS 70D. - Canon EOS 80D. -Canon Powershot SX50. Foto&Tech 3.0" LCD Hood fits most camcorders with a 3.0" LCD display. The LCD Hood blocks out annoying glare caused by direct sunlight on the LCD display. I did not have a 5D Mark II to test mount this hood. LCD clear plastic cover is clear and no deep scratching. Testing- We do our best to test the major functions of each item, but we do not do a complete testing of everything. 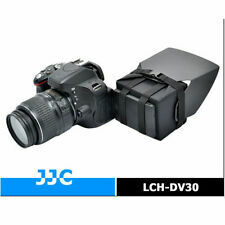 LCD optical viewfinder is designed for LCD screen viewing of digital. 1X viewfinder with an eye cup and magnifying lens. Magnifies LCD screen. Suitable for most 3" LCD screens with up to 60mm X 45mm viewable area. For Sony Alpha a6400 ILCE-6400. Universal Screen Guard that fits from 1.5" to 5.0" LCD Screen Size. Cut to Size Guide Included to cut exactly what your LCD size is. 3 (Three) Universal Screen Protectors. Buy With Confident. All JJC and Kiwifotos Products Are Back By 1 Year Manufacture Warranty. The LCD hood side wings are guided by spring mounted hinges that open automatically when the top flap is opened. 1 (ONE) Delkin POP-UP SHADE /LCD PROTECTOR. ALL NIKON AND THE FOLLOWING MODELS AVAILABLE. YOU PICK THE MODEL. WHAT YOU SEE IS WHAT YOU GET. 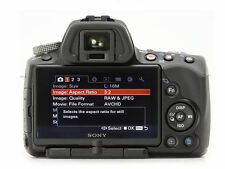 Compatibility: Nikon D700. More than average wear for the age of the item, and may have dents, dings or finish loss. Glass may have marks or blemishes, but should not affect picture quality. Improve your outdoor viewing experience on yourmonitor with this Sun Hood from SmallHD. Made from flexible neoprene and rigid plastic, the hood fits over the outside chassis of the monitor and stretches to cover the screen and block out stray reflections. Two pieces of LCD screen Cover for Nikon D100. Similar to Nikon BM-2. 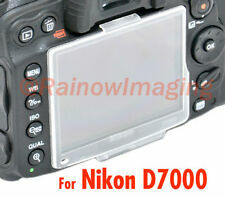 2 x LCD Cover for Nikon D100 Similar to BM-2. 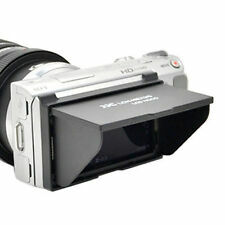 Elvid Optiview 100 LCD Viewfinder Condition is Used. Ultra-thin design allows for more than 92% light transmission, maintaining the viewing properties of your LCD. In addition, the UV coating allows for sharp, crisp images with correct color balance. ACMAXX HARD 3.0” LCD SCREEN ARMOR PROTECTOR FOR FujiFilm X100F. It is a special made shape larger than univeral 3.0" protector, regular 3.0" will not fit perfectly on X100F. What is ACMAXX LCD ARMOR?. Kodak Series V Adapter Ring #18. From estate sale. It has a few scratches, but still works good to protect the screen! 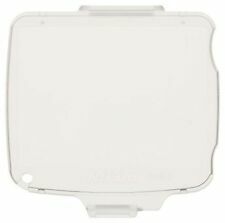 Easily attach and detach either the canopy or the entire accessory as desired. Herlein Photography and Stuff is an Authorized Dealer for Delkin products. Protect and Shade Your LCD. The glass features 6 layers of protective material that protect your display screen from dirt, scratches, sweat and oily fingerprints. The glass also blocks UV rays while allowing visible light in. The protector is easy to install and remove. For theHoodLoupe mounting cords only ! HoodLoupe is NOT INCLUDED. Live View Shooting is greatly enhanced by mounting your HoodLoupe over your LCD screen. Glare-free images help you compose and pull focus like a pro. 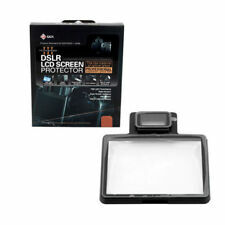 ACMAXX HARD 3.0” LCD SCREEN ARMOR PROTECTOR FOR SONY Cyber-shot DSC-HX400V. What is ACMAXX LCD ARMOR?. ACMAXX LCD Armor is a hard Poly-carbonate screen protector with UV Low-Reflection Coating. This technology allows ACMAXX LCD Armor to effectively reduce reflection of sunlight and interior lighting to provide vivid pictures wherever you are. For Canon EOS Rebel T7i SL2 77D. Universal Screen Guard that fits from 1.5" to 5.0" LCD Screen Size. Cut to Size Guide Included to cut exactly what your LCD size is. 3 (Three) Universal Screen Protectors. Model: BM-10 Compatibility : Nikon D90. 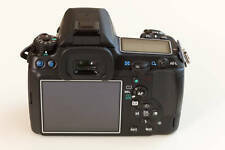 Up for sale from KEH is thisNikon BM-10 LCD Cover (D90). More than average wear for the age of the item, and may have dents, dings or finish loss. Glass may have marks or blemishes, but should not affect picture quality. Protect your camera's LCD panel to against dust and scratches and to eliminate glare Offers tough, durable, transparent surface while keeping the LCD screen clean and unscratched Attaches smoothly with self-adhering surface; leaves no residue when removed Scratch-resistant which increases the durability and value of the camera . Trending at $4.68eBay determines this price through a machine learned model of the product's sale prices within the last 90 days. SmallRig Sun Hood 2085 is exclusively designed for Canon C200. It protects Canon C200 monitor from direct sunlight while shooting outside. It could be mounted on the monitor with great ease with the help of magic fasteners. These covers are generic covers not Nikon covers. See the picture for detail. WHAT YOU SEE IS WHAT YOU GET. We are a CANON USA authorized dealer. ACMAXX 2.7” HARD LCD SCREEN ARMOR PROTECTOR SCRATCH PROOF UV COATING. What is ACMAXX LCD ARMOR?. ACMAXX LCD Armor is a hard Poly-carbonate screen protector with UV Low-Reflection Coating. This technology allows ACMAXX LCD Armor to effectively reduce reflection of sunlight and interior lighting to provide vivid pictures wherever you are.